Over the course of its lifetime it is likely that a commercial or industrial roof will experience damage or require repairs after a major weather incident. This is particularly true in the case of businesses located in Western Australia, which is well known for its hazardous and sometimes extreme weather patterns. A spate of bad weather or even a one-off incident can cause so many serious issues for a roof (and for commercial roofers), including hail and wind damage and flooding. Fire – whether accidental or as a side effect of an emergency – can also cause serious, if not catastrophic, damage to a building and its roof. It is likely that in the event of an emergency of this kind, your first response will be to try to quickly fix the issue and protect the building from further damage. 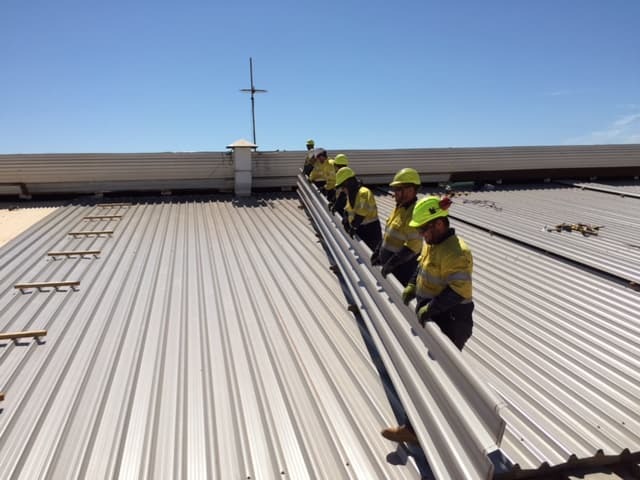 It is important at this point to contact commercial roofers such as PRC Building Services that offer a specialist emergency response service, rather than a generalist builder or roofer. This is because PRC Building Services have years of experience working with companies to prepare their buildings as well as providing immediate assistance in the event of an emergency. No one likes to think of their roof taking the full brunt of a storm, and services such as the cyclonic tie downs offered by the company can greatly reduce the chance of roof damage and provide peace of mind for the building owners and managers. If your roof is damaged during an emergency, it is also important to secure the building effectively and ensure that the damage to the interior is kept to a minimum. It may be possible to protect the inside spaces depending on the type of emergency, while the commercial roofers are securing the roof and assessing it for potential hazards and risks. In the event of a leaking roof, all interior ceilings and walls should be inspected for water, and the source of any leaks should be found if possible. In the immediate aftermath of a storm or other emergency event, you can use buckets and other containers to catch water, or place tarpaulins or other sheeting over expensive or important items, computers or machinery. Obviously if employees are still within the building it is a good idea to have them leave until the building has been made weather-tight or until it has been assessed to be safe. It also goes without saying that all commercial and industrial buildings should be insured for this type of emergency, and any relevant documentation should be stored in a secure and easy to access location. Policies should also be checked regularly to ensure they meet the needs of the business and reflect the building and its contents. It pays to be prepared, especially if your building happens to be in a location that experiences serious weather on a regular basis. It is a good idea to have an emergency response plan just in case of a storm, cyclone, hail, lightning or fire, and it should contain details of your preferred commercial roofers as well as information for organisations such as the Fire and Emergency Services Authority.